VCFA visuals #7: which is your favorite? I like the 2nd one best. If the third weren’t so wide, the askew trees would be more in balance. Sonya, so you prefer the little bit of rooftop showing to no rooftop? Top, without question . . .
Ha! Mine too. Do you want to say why? My favorite is the top. Love the lone tree and the purple sky. I’m going to say the bottom one because it makes me feel the moon is attainable. I hadn’t thought of that, Linda. Nice. I was first going to say the top one. 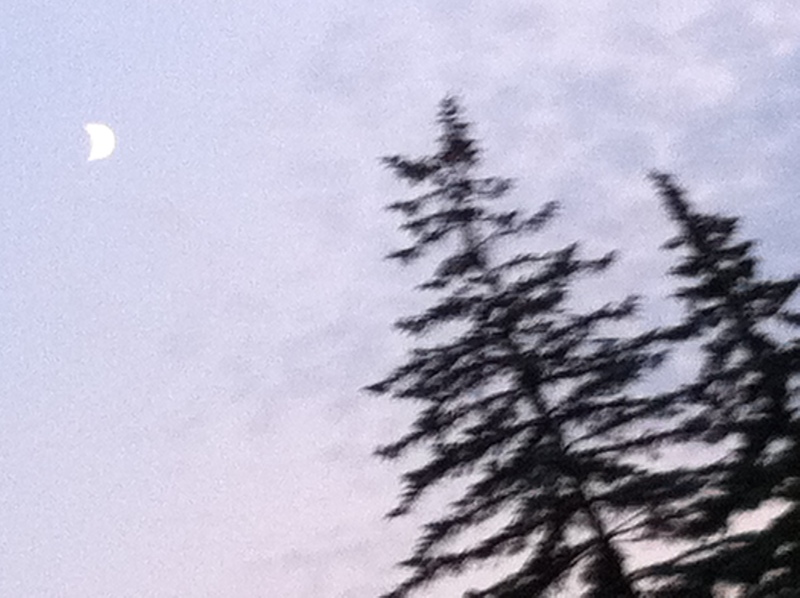 One tree, one moon. But then I just loved the closer feeling of the last one, with the two trees. It’s a different framing than I would imagine. Cherry, I was trying to choose just one for a post and was thinking the top one was my favorite. And then I thought, well, there’s something cool about the inclusion of humanity suggested by the rooftop, as well as the hint of another tree. And then, there’s something so comforting about the two trees together in the bottom one. I’ve loved hearing what other people thought. I took all three one after the other with my iPhone 4–no special effects. I love the top one as well. 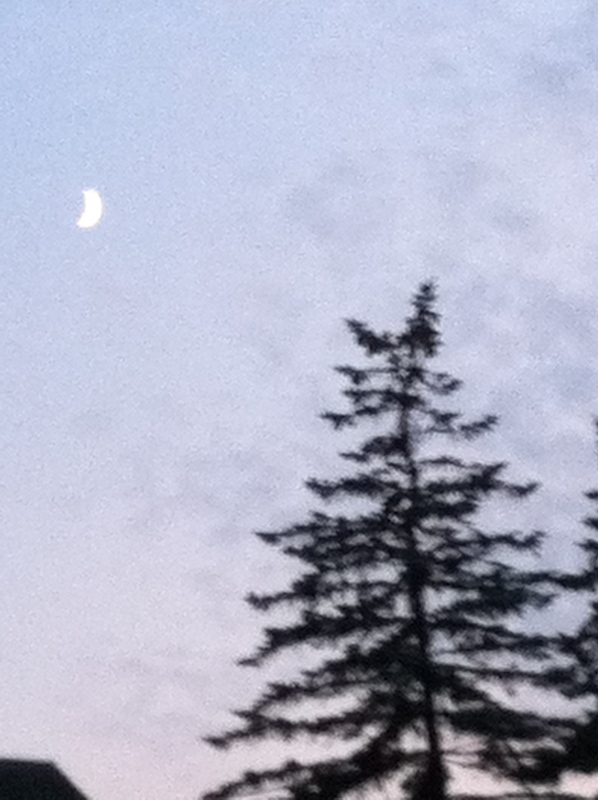 I love the color of the sky as the tree admires the moon. 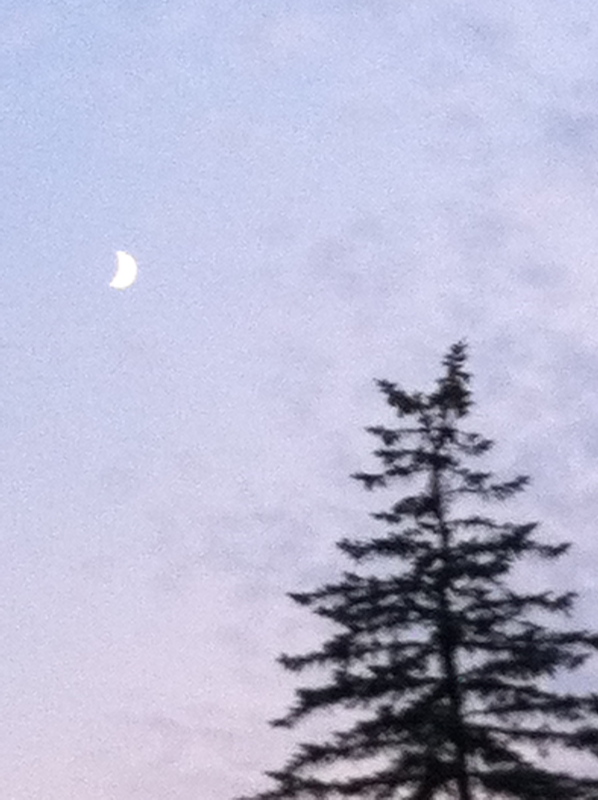 Andrea, nice new take on the tree admiring the moon. I see that now, and I didn’t before. Thanks for taking the time to leave a comment. ~and sorry it took so long for your comment to show up; for some reason, I didn’t get notice of it. Lovely, all. I vote for the one at the top. Thanks. The top one does seem to be the favorite.